Spotify is slowly rolling out new features for artists that I’m very happy about. Before, you had no control as to what photo was used, what bio was used, heck, what tour dates were used for your artist (I’ve seen managers complain Spotify confusing their artist’s tour dates with another artist’s name). It was really messy. Now, it’s really easy to start managing your own profile, and more importantly understanding your audience on Spotify. Let’s break it down on what you can do, shall we? 1. Verification is easy as 1-2-3. You no longer need 250 followers to get a checkmark by your artist profile [insert sigh of relief]. As long as you can connect your Twitter account with your Spotify artist account and provide your links (think: website, socials, etc. ), you’ll be connected to your artist account and instantly verified. 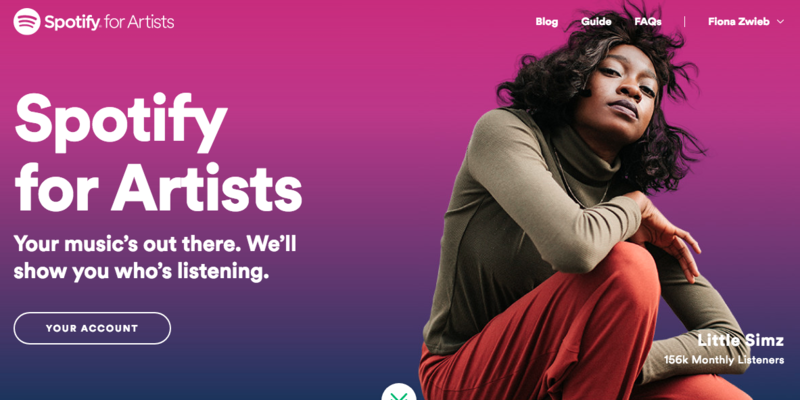 This tells people this is your artist profile & allows your music to be considered for Spotify playlists. 3. Update your bio. Before a couple weeks ago, Spotify didn’t have your bio, or normally would pull an outdated one. Now you can update your bio within minutes for a new single release or special promotion. Plus, if you have a wikipedia page, you can link that too. Pro tip: Spotify bio’s must be kept under 1500 characters and you can link it to songs, playlists or albums on Spotify that you want to feature. 4. Concert Calendar. Now it’s not perfect yet, but improved. Before, you had to have your concert dates on Songkick for it to sync to your Spotify page. Now, any events on Ticketmaster, AXS, Eventbrite, and Songkick will show on your page! My fingers are crossed for a partnership with Bandsintown – can we push that through? 5. More thorough stats. With access to your artist page, you can now view number of listens, who is listening and where they are listening from. Valuable information that before you couldn’t get anywhere else. I typically get my artist’s stats from Next Big Sound, but unfortunately they haven’t worked out a deal with Spotify to show their numbers, so I’m relieved to find Spotify is stepping it up with their reports. PLUS – you can now see how many listens you have, even if it’s less than 1,000. So if you’re on Spotify, it’s definitely worth your time to log in and check on your artist site and make sure your profile is up to date. With 50 million paid subscribers, you want to look good.